Why is receiving voicemails still such a pain in 2015? With landlines you need to deal with overpriced and outdated hardware. On mobile phones you need to call a number, enter a password, and sift through the voicemails until you reach the one you want. Wouldn’t it be easier to just receive a text message to listen to a new voicemail? Fortunately, Twilio plus a little Java code gives you the power to do just that. In this blog post we will use Apache Tomcat and Twilio to create a virtual answering machine that will receive and record all incoming calls. The answering machine will then text you a link to hear the message that was left for you. If you don’t want to follow along and just want to see the code, it has all been open sourced in this Github repository. The first step to building our answering machine is to set up our environment. Let’s walk through the setup process now. We will be using Tomcat to run our servlets. 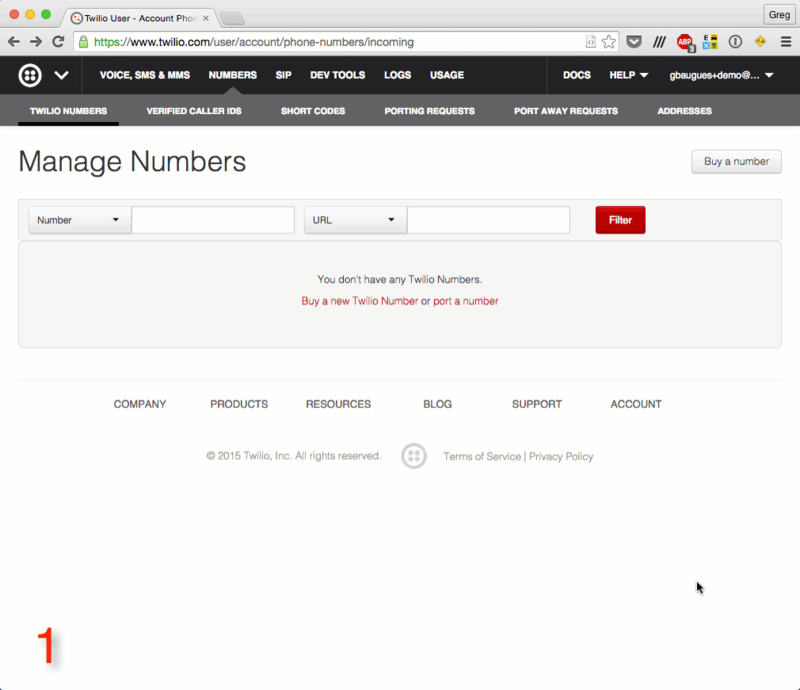 Twilio’s Quickstart can help you get started with Tomcat and the Twilio SDK. Alternatively, you can just download this archive I’ve put together that contains Tomcat 8.0.26 and the Twilio Java SDK 4.5.0. There may be a few extra folders in your /webapps/ directory that came with Apache. You don’t need to worry about removing them as they are contain the Tomcat homepage and documentation pages. You will not see AnsweringMachine.java, CallRecorder.java, or web.xml because we will be creating those files ourselves. If you see a page like the one above then your environment is setup correctly and we can move on! If your terminal shows an error saying java.net.ConnectException: Connection refused do not worry, it just means that your server is already not running so there is nothing for the script to shut down. The first few lines are just XML meta-data that we don’t need to modify. The block is where we are naming our servlet and telling Tomcat to look at the com.twilio.AnsweringMachine path for a Java class. The block specifies that requests made to the /handle-call endpoint should be handled by the servlet named AnsweringMachine that we defined just above it. Let’s create the AnsweringMachine class now! Our AnsweringMachine servlet will receive all incoming calls to our “voicemail”. By “voicemail” I’m referring to the Twilio phone number we will purchase and set up later on in the post. Navigate to /webapps/twilio/WEB-INF/classes/com/twilio and create a new file called AnsweringMachine.java. The servlet is going to return TwiML instructions to record all incoming calls using the verb. // Record the caller's voice. You’ll notice we are sending our recording to a /twilio/handling-recording endpoint but we don’t have a block for that endpoint in our web.xml file. To handle this, we need to create another servlet. This mapping will send any requests made to the /twilio/handle-recording endpoint to the CallRecorder servlet to be handled. We need to create the CallRecorder class as well. 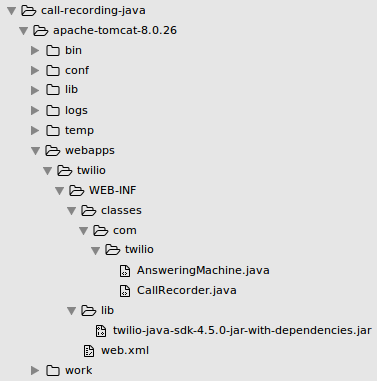 Navigate to /webapps/twilio/WEB-INF/classes/com/twilio and create another new file named CallRecorder.java. This servlet will send an outgoing messages notifying the user that they received a voicemail and will contain a link to the recording of the message. Lucky for us, Twilio takes care of storing the recording so we do not have to worry about writing files to our server. The service method is simply going to pass a couple of the incoming request’s parameters into a new method named sendSMS which we will create in a minute. We need to configure our account credentials in order to authenticate with Twilio and send outgoing messages. We will define some constants to do this. Your ACCOUNT_SID, AUTH_TOKEN, and TWILIO_NUMBER can all be found in your Twilio account dashboard. Set YOUR_NUMBER to your actual phone number. Here we are instantiating a TwilioRestClient object with our account credentials and using them to send an outgoing SMS using a MessageFactory object. The text message will contain a message body informing the user of their new voicemail, and it will be sent to the specified “To” number from the specified “From” number. Feel free to modify the message body to your liking. That’s the last of the Java we will need to write. Take a minute to celebrate! Here we are specifying the paths of the Java class files for the classes we imported at the top of each .java file. Any time you make changes to your .java files you will need to run this command to recompile them. If you are receiving compilation errors then the classpaths specified in your command are not correct or you are running the command from the wrong directory. The last step before we can record calls is to make our Tomcat server publicly accessible so that Twilio can reach it. We can use ngrok to do this. Ngrok is a command line tool that can create a public tunnel to access your localhost. If you’ve never used ngrok before consider reading this blog post by Kevin Whinnery to get familiar with it. You can also read my colleague Phil’s recent post, 6 awesome reasons to use ngrok when testing webhooks, to get a good understanding of Ngrok’s more advanced capabilities. Configure your Twilio number’s Voice Request URL from step 4 of the above gif to reach out to your ngrok URL from the window above with your Tomcat endpoint appended to it (e.g. http://229cd6dd.ngrok.io/twilio/handle-call). 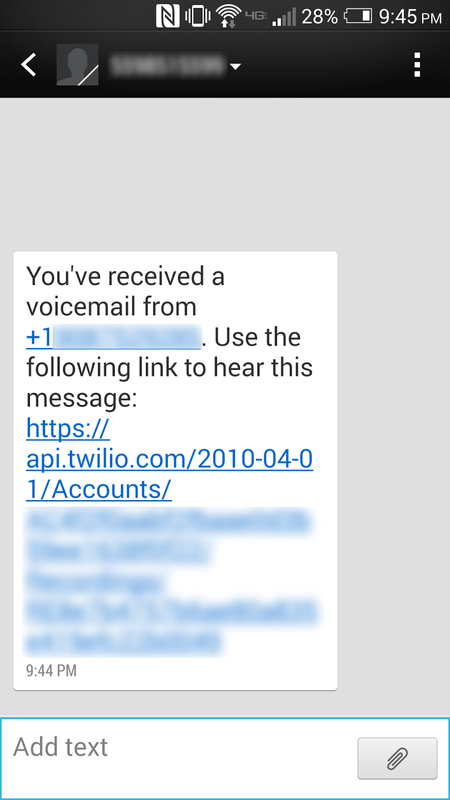 Then scroll down and be sure to click save to save your Twilio number’s settings. Start your server again with $ sh bin/startup.sh and let’s test this bad boy out. Call your Twilio number and you should hear a greeting before leaving yourself a voicemail. After you hang up you should receive a text with the link to hear the recording you just made. set up multiple answering machines to record different types of calls, such as customer support, incoming orders, shipment tracking, etc. call yourself and record important messages for later. If you are interested in building a similar app with Java and Twilio Voice, check out my recent How to Warm Transfer a Call with Java and Twilio post, which uses much of the same setup as this post.